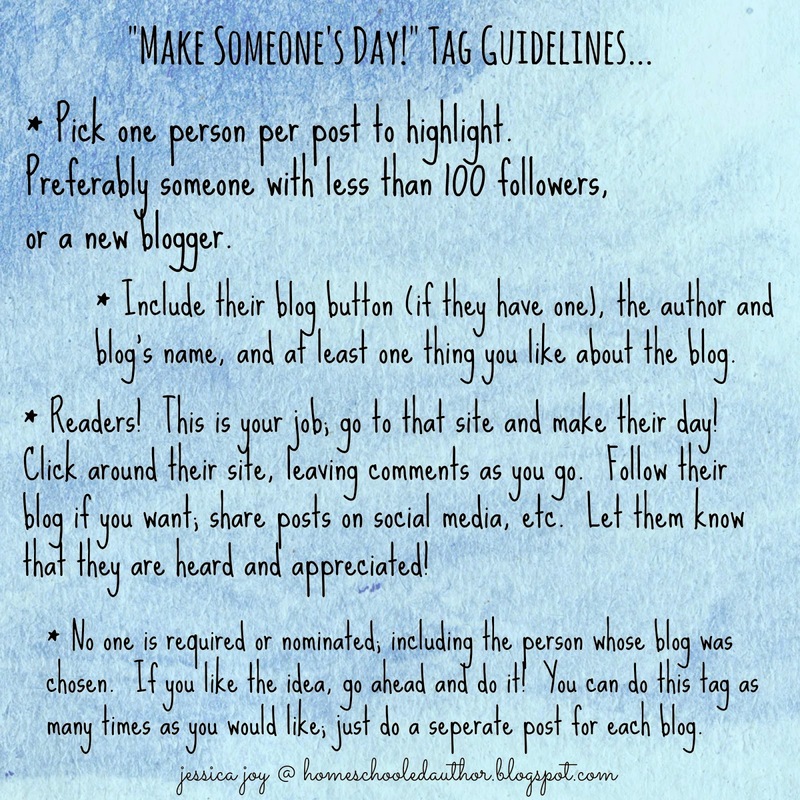 A while ago, Jessica from the blog (Almost) Perfectly Pink, created the tag 'Make Someone's Day'. When I saw it, I thought it was a great idea. I just had to do it. When I started blogging, four years ago, the first person I met was Charlie from the blog, Diary of an Unschooling Teenager. In the years we've known each other, we've become really good friends. Charlie's always visiting my blog, leaving amazing comments, mentioning me over on her blog and encouraging me. 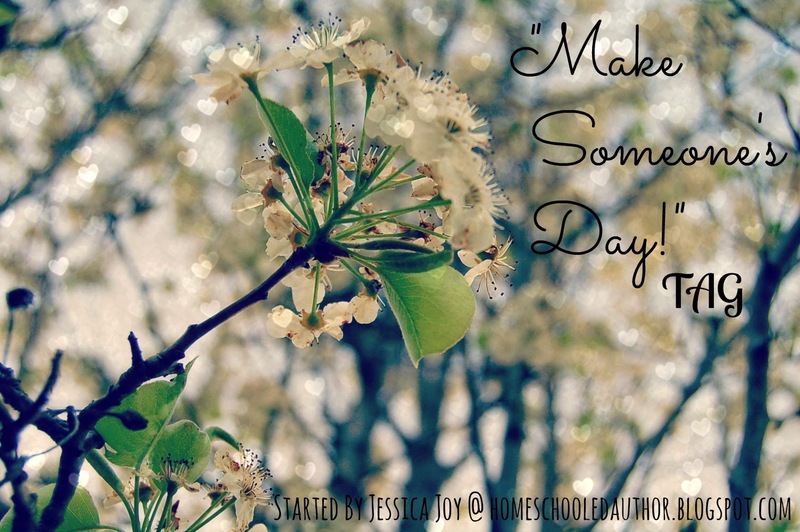 On her blog, she writes about music, writing, photography, DIYs, books and so many other things. She really inspires me with everything she posts about. Like me, Charlie's a photographer. I like looking at all the photos she posts over on her blog. They're really beautiful. It's nice to be able to share this hobby with her. I love how friendly Charlie's blog is. She treats every reader like they're her best friend. I'm always so excited to visit her blog. If you'd like to visit the Diary of an Unschooling Teenager, then I'm sure Charlie would love to see you over there. And if you'd like more awesomeness, Charlie also has an etsy shop where she sells miniature clay models. They're really cute. If I had the money, I'd buy everything in her shop. I have no idea how she makes something so small. Thank you Charlie for being my friend and visiting my blog for all these years. Have you visited Charlie's blog yet? Do you have any blog recommendations? I'd love to hear them. Aww Sophie! This truly made my day! Thank you so much - for this and also being such an awesome friend :) It's so amazing to know you! Thank you for being the awesome friend. I'm so glad I started reading your blog all those years ago. I haven't been on Teen Blogger Central much. I actually forgot I left my link there! Thank you so much for stopping by. This is an awesome tag, maybe I'll do it soon too! I like how you wrote this post, you've captured that special feeling of blogging friendship so well. I'm definitely checking out Charlie's blog now! When I saw the tag I just couldn't resist doing it. It's such a nice idea.